I am a yogurt fool. I have loved it pretty much since the first time I had a little supermarket-bought plastic tub. Since then, I’ve been going from brand to brand and type to type, discovering new and better varieties. A major high point (as would be for any yogurt lover I think) was trying Greek yogurt while working on a project in Greece. A creamier, more perfect yogurt I am hard pressed to find to this day. Although I am still a plain ride away from real Greek yogurt, I have come a long way since that first tub from the supermarket. I am happy to report that I have found two suppliers that sell wonderfully creamy natural yogurt – both from local dairy farms! Aside from being a breakfast staple, baking ingredient, and quite the talented player in dips and dressings, yogurt also has the ability to comfort me during troubled times. Don’t get me wrong, chocolate is still number one in the fix-all department, but yogurt has its place in the medicine chest too. Whereas chocolate is more like a powerful happy-pill, yogurt is a soothing anaesthetic. It’s clean, fresh, light taste (and texture) is like a salve on my wounds…calming and quieting. When the charming Bordeaux of Marita Says (love him and love his blog!) chose yogurt as the theme for this round of Hay Hay it’s Donna Day I was ecstatic! Flavor my own yogurt oh my! Many combinations went through my head and I had a few top choices planned but I, erm, missed the deadline 🙁 Luckily Bordeaux (did you read my mind friend?) decided to extend it…so here I am with Chai Spiced Yogurt! – Make the syrup by placing the honey and water, and all the spices in a small saucepan. Stir over low heat until small bubbles appear on the side. Remove from heat and let it “steep” for about 15 minutes. – Beat the yogurt and cream together until light and creamy. – When the syrup has cooled, beat into the yogurt/cream mixture. 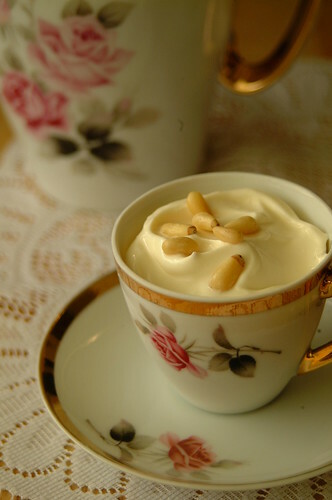 – Spoon into individual cups and sprinkle some pine nuts to top. If it’s not sweet enough for you, you can also top with more honey. This certainly took yogurt up to the next creamy level! It was quite dessert-like and, aside from on its own, would also make a fabulous topping for cakes and tarts. The yogurt I used is already creamy, so I’ll be using less cream (probably half) the next time I make this.